Do you have knee high boots like Emma Peel? I was a great fan of The Avengers when I was a child. How does a woman with bound feet “run away” from her family? This is the question that has haunted me ever since I was a child when I heard the story of my great-grandmother who had bound feet. It’s difficult for us in the modern world to imagine how small bound feet were. Whenever I say to people that some of the smallest bound feet were only 3 inches long, they register that that is small but it’s only when they see exactly how small 3 inches is, that the horror of it hits them. In order to illustrate how tiny bound feet were for “Breaking Tradition”, my award-winning talk inspired by the stories in Bound Feet Blues, I went online to order a pair of baby shoes. I searched and searched for baby shoes that were 3 inches long but the smallest size that I could find came to just over 4 inches. As part of my inquiry what it would like to walk with bound feet for my performance of Bound Feet Blues, I found this video of an elderly Chinese woman with bound feet. I have been watching it to get a sense of her movement so that it can help me portray the walk of a woman with bound feet in my show. Do you suffer from shoe envy? In Bound Feet Blues, I talk about how I used to envy men their solid, sturdy shoes. Men’s shoes give them the freedom to stride around as if they own the world. Whereas some women’s shoes – especially the more feminine, delicate ones – felt like they hobbled me and restricted my ability to move around. 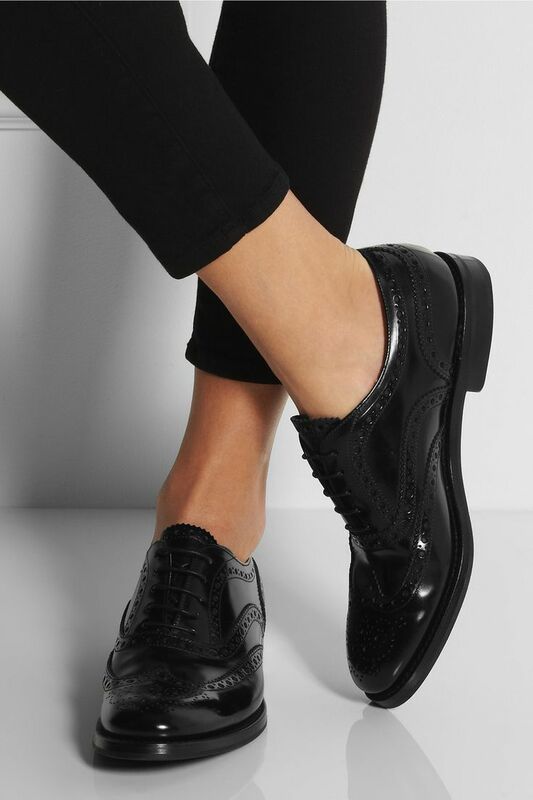 In particular, I loved the look of brogues and longed to own a pair. But men’s shoes are of course huge and would never fit me. And I would feet too embarrassed to go into the men’s section of shoe shops to ask to try their shoes on. Do you suffer – or have you ever suffered – from shoe envy too? And if so, what and who did you envy..? What was it like to walk with bound feet? This is the question that I am thinking about at the moment during the development of my performance for Bound Feet Blues. How would having bound feet have affected the way you would walk? How would it have affected your outlook on life, going through the process of the brutal procedure over a number of years and then having to live the rest of your life crippled in this way? You will have seen my earlier blog post about the film Snow Flower and The Secret Fan and also the clip which I posted showing the footbinding scene from that movie. That film has been a useful resource in depicting the way that women with bound feet would have walked. The movie seems quite careful and meticulous about depicting bound feet – after all the whole premise of the story is founded on the women having bound feet. They show what bound feet would have looked like in their little socks and slippers. In long shots, we can see the tiny feet under the women’s gowns (I’d love to know what special effects they used to make the women’s feet seem so small). It looks like in the performances as well, care was taken to depict how women would have moved with bound feet. “Only through pain will you find beauty,” says Snow Flower’s mother as she makes her daughter walk with her feet bound. In my research for Bound Feet Blues, I’ve been looking into what it was like for young girls to have their feet bound. I came across the movie Snow Flower and The Secret Fan – see my blog post from earlier this week “Beaches” with Bound Feet – footbinding and female friendship – which is all about footbinding. It is painful to watch and is a moving dramatisation of what it must have been like for little girls who had to endure this brutal process. The one comment I would have, however, is that from my research, footbinding is a process and not just a one-off as the film suggests. 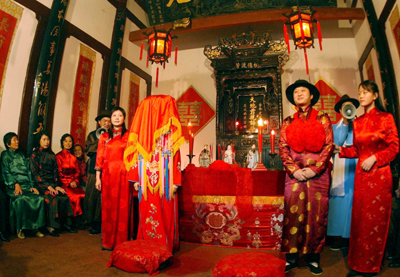 In Chinese tradition, where marriages were made for social or business reasons and where women – especially those with tiny bound feet – were seen as trophies, there was a recognition that women would not find much emotional comfort, love or meaningful human connection with their husbands. So as part of this tradition, girls were given “sworn sisters” who would be their emotional partner – rather like the “blood brothers” relationship that boys would have. These formally sanctioned and socially accepted partnerships were known as “laotongs”. I learnt about this intriguing custom from the film Snow Flower and The Secret Fan which I discovered over the weekend, based on the novel by Lisa See. How had I not known about this touching tradition before now! I am so excited that the Arts Council has granted funding for the development of Bound Feet Blues! The funding enables us – my director Jessica Higgs and me – to work on the creation of the performance and explore the most meaningful way that the story can be brought to life on stage. Our work in progress will culminate in the showcase performance at the Tristan Bates Theatre in Oct – show details below.